Baggage Capacity 74 cu. ft. 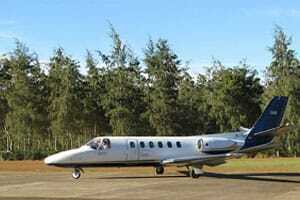 The CJ1 is the second generation of the successful Citation series. 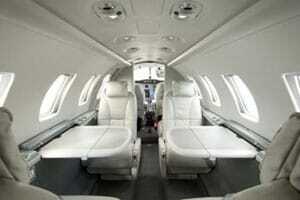 The CJ1 is a light jet that seats 5 passengers. It has a 1,300 nm range and has a maximum cruising speed of 447.41 mph. Another of the CJ1’s strong points contributes to its low operating cost as well: the simplicity (but reliability) of its flight systems. It uses the Pro Line 21 avionics package, complete with PFD (Primary Flight Display) and MFD (Multi Funcion Display) flat-panel screens. The CJ1 is the first business jet to be equipped with these screens (with the exception of the gigantic Boeing Business Jet). The CJ1 is extremely easy to fly and can be single-pilot operated. Despite the CJ1’s economy in flight, it allows for a surprisingly high payload. Its three baggage compartments can carry up to a total of 832 pounds of luggage. The CJ1 was specifically designed to be able to operate on short runways. At sea level the CJ1 can take off in 3,080 feet; on runways at an altitude of 5,000 feet, its takeoff distance increases to a mere 5,710 feet.